The XM5 features three 10G SFP+ or XFP ports and up to four SFP or RJ-45 gigabit ports for UNI or NNI deployments to deliver wholesale Ethernet, 4G/LTE mobile backhaul, business and cloud services. The XM5 can be deployed as a node on a 10G ring with ports for Gigabit and 10G spoke links, or as a demarcation NID on a 10G access link with aggregation UNI ports for multiple tenants or cell towers. The XM5 can be deployed to deliver a variety of 10G and gigabit services, and simplifies operations by reducing the need to inventory multiple NID models. Gigabit SFPs can be installed in the 10G ports to provide a seamless upgrade path to future 10G services. In this application example, an iConverter XM5 NID is deployed as a mini-aggregation node on a 10G Metro Ethernet ring that provides connectivity to the ring and three fibre access links to customer locations. 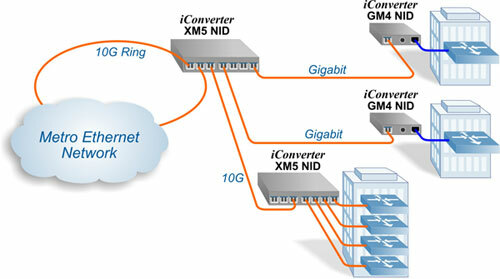 iConverter GM4 NIDs terminate the gigabit fibre links and provide service demarcation at each customer premise. The other XM5 NID terminates the 10G fibre access link and provides demarcation at a multiple tenant building with four SFP UNIs for fibre connectivity to different subscribers. In this application example, iConverter XM5 NIDs are deployed as nodes on a 10G wireless backhaul ring. The XM5 on the left is connected to the Wireless Backhaul Network, and provides NNI demarcation between the Wireless Carrier network and the Access Provider network ring. All XM5 NIDs on the ring support G.8032v2 Ethernet Ring Protection Switching for service protection with sub-50ms failover. The XM5 NIDs on the right provide ring connectivity with gigabit and 10G access links (spokes) to cell towers with 1588v2 Packet Timing Protocol.